Back it up! is a backup program that creates ZIP files and mirror functions via copy or FTP. Several backup sets can be configured. Folders and separate files can be added to each backup set. For each backup set there`s the option to delete specified files depending on the extension you enter. 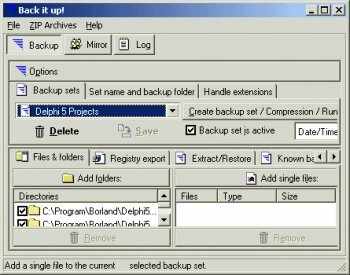 For each backup set extension for files that should not be included in the backup can be specified. It takes command line arguments so it can be executed from a batch files for example.